LAS VEGAS (UNLVRebels.com) – Last season, the UNLV men’s basketball team won 20 games for the first time in four years en route to recording an impressive nine-game improvement in the win column. 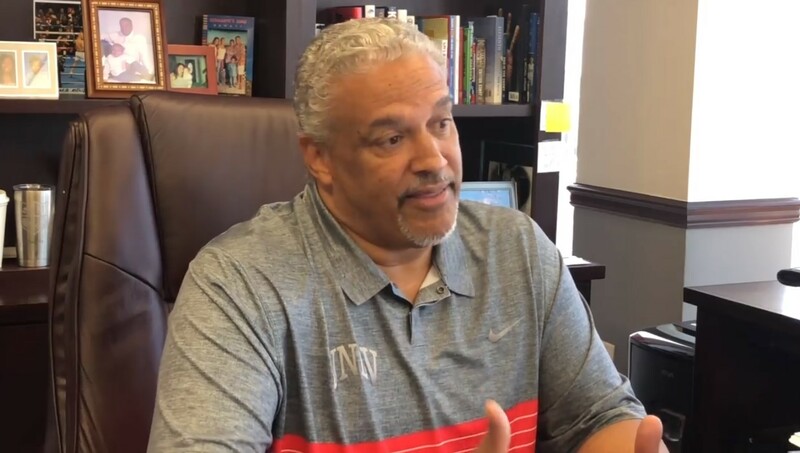 As Marvin Menzies enters his third season as head coach of the Runnin’ Rebels, the squad returns seven players who saw action last season – the most for UNLV in seven years. That’s the kind of stability that Menzies is accustomed to and what he envisioned when he returned to Las Vegas to lead the program in 2016. UNLV basketball has a storied history and a proven track record of winning at a high level. It’s been done before and it can be done again. “There is no secret formula,” Menzies said. “You go out and recruit high-character kids, but it is a process that takes time. We work on it daily. Menzies’ plan follows a blueprint that was successful during his nine years leading New Mexico State. The Runnin’ Rebels are also extremely active in the community – as their Twitter account (@TheRunninRebels) illustrates – and for the first time in Runnin’ Rebel history they have achieved over a 3.0 collective grade point average in two straight semesters. The large group of returners includes All-Mountain West Second Team performer (senior) Shakur Juiston, who averaged a double-double last season with 14.6 points and 10.0 rebounds per game, sophomore Tervell Beck, senior Kris Clyburn, sophomore Amauri Hardy, sophomore Mbacke Diong, junior Cheickna Dembele and sophomore Jay Green. Senior Noah Robotham and junior Nick Blair, both originally from Las Vegas, were redshirts last season after transferring; sophomore Ben Coupet Jr. used his redshirt year and sophomore Djordjije Sljivancanin had a medical redshirt. A quartet of talented freshmen has also been added to the roster, making up the No. 2-ranked recruiting class in the Mountain West. Every member of the 2018-19 roster will be on campus for workouts this summer, with all but one already in Las Vegas and taking part. “Everyone has been working extremely hard this offseason,” Menzies said. “With the change in rules we have the chance to work with the guys a little more during the summer and we will benefit greatly because of our continuity. The returners will help deliver our messages to the new guys and it only grows from there.